We improve the education of medical students by providing a progressive series of clinically-based rotations throughout New Mexico in the student's chosen field of medicine, including primary care, rural health care and health professions shortage areas. The UNM School of Medicine is internationally recognized for its evolving curricular innovations addressing community health needs and adapting adult learning theory to medical education. The Continuity Clinic experiences provide integrated activities that focus on sequential skill-building opportunities that include the biological, population and behavioral perspectives. Continuity experiences allow students to work with physicians who have long-term relationships with patients, families, multidisciplinary health care teams and mentors. PIE is the opportunity for students to learn in the setting of a rural clinical practice and experience what it’s like to be an actual practicing physician. In addition, students are able to integrate the skills and knowledge they have gained during the first year of medical school in a community clinical setting. Medicine in New Mexico allows students to develop clinical skills in their area of specialty as well as apply public health skills and concepts they have learned to a community. 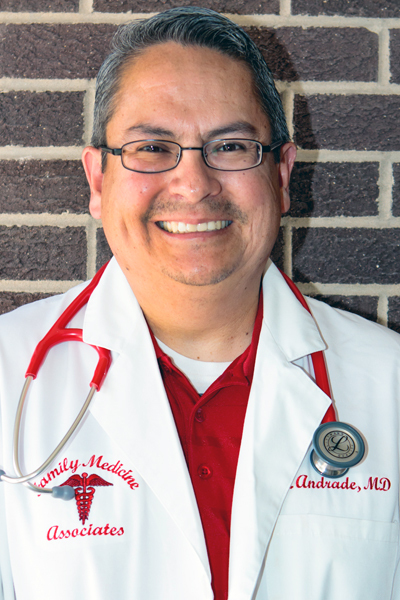 Dr. Lawrence Andrade is a Gallup, NM, native, the son of a lifelong railroader and the first in his family to graduate from college. He earned his BS in biology at UNM in 1994 and graduated from the UNM School of Medicine in 2000. He completed his family practice residency at the University of Texas Health Science Center in San Antonio, where he was chief resident during his third year. Dr. Andrade served as a staff physician at Rehoboth McKinley Christian Hospital in Gallup from 2003 to 2009 and has been in private practice since then. He has served as a preceptor for the UNM School of Medicine PIE and PA students since 2004 and has mentored several Gallup-area students to enroll in UNM's Combined BA/MD Degree Program. He also volunteers as the team doctor for Gallup High School and Miyamura High School athletics and serves as medical director for the McKinley County Adult Detention Center and the Rehoboth McKinley Urgent Care Clinic. About the Award: The Practical Immersion Experience (PIE) introduces UNM medical students to the practice of clinical and community medicine in rural communities throughout the state. The community faculty who serve as preceptors for this course make significant sacrifices to host students for six weeks. This award recognizes the contribution of these preceptors, who have gone above and beyond to support the PIE program and the School of Medicine.